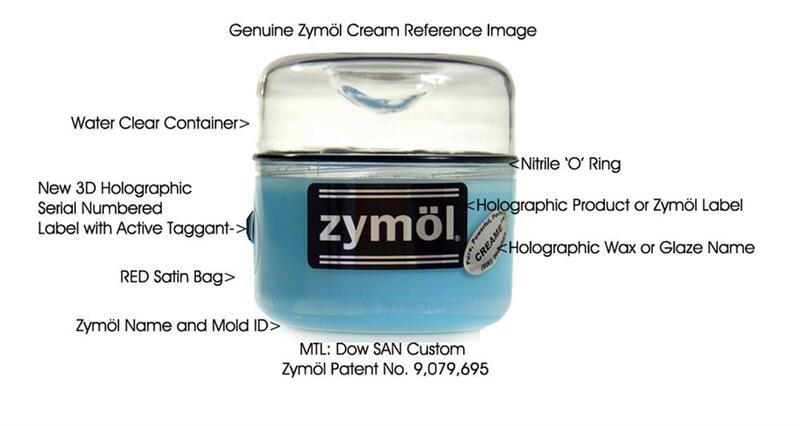 Zymol Creame Wax is superb for light-coloured cars. Creame Wax contains 33% Brazilian Number One Yellow Carnauba by volume combined with pure banana and coconut oils to enhance that "wet look." Zymol Creame Wax is actually a "zyme" that turns into a wax and bonds to your paint when exposed to air during application. All Zymol waxes measure eight ounces and include wax applicator. Carnauba Wax (derived from Palmetto), Montan Oil, Coconut Oil, Banana Oil, Propolis (derived from Bees), Cetyl Esters, Cetyl Cocoamide (derived from coconut oil) and FD&C Blue #1. 1. Wash and dry using Clear Auto Bathe. 2. HD-Cleanse surface to ensure 100% wax bonding. 3. Using the included wax applicator apply a small amount of wax onto a 2’x 2’ surface using a side-to-side motions. 4. Let stand for about 3 minutes. 5. Using a Zymol Microfibre slowly wipe the wax in the opposite direction with light pressure to ensure a uniform coverage, wait 20-30 seconds. 6. Turn your Microfibre and buff the surface briskly to set and crystallise the Carnauba to a deep shine. 7. Let cure for 30-45 minutes. 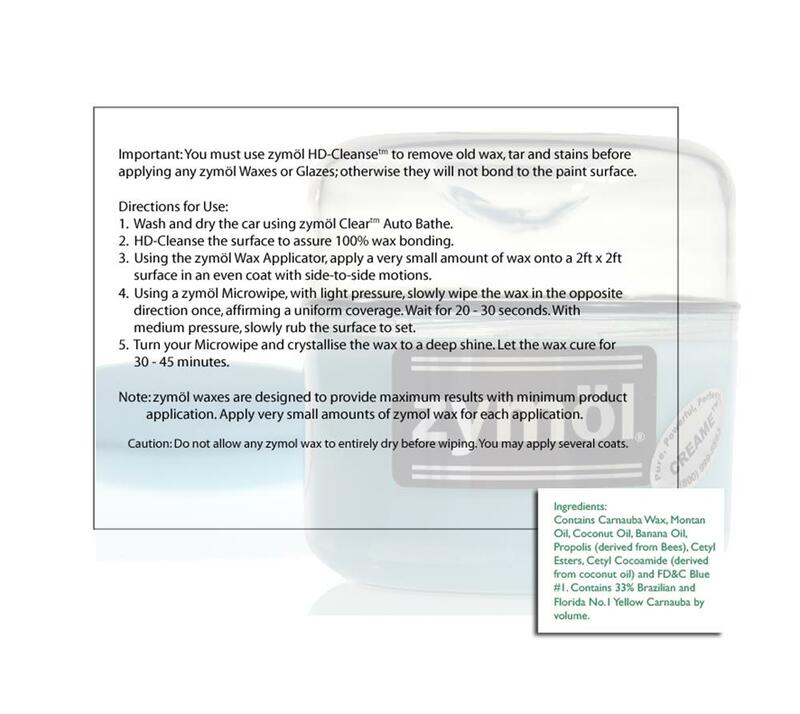 Important: You must use Zymol HD-Cleanse to remove old wax, tar and stains before applying any Zymol Waxes or Glazes; otherwise they will not bond to the paint surface. 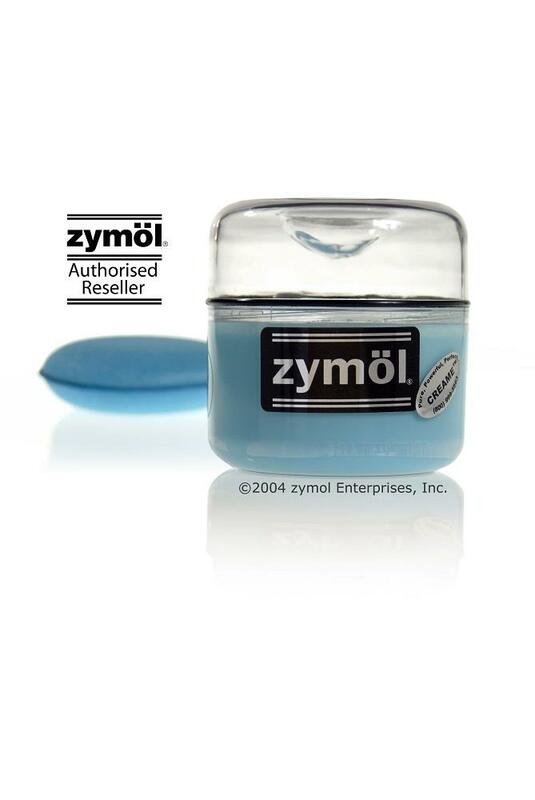 Note: Zymol wax is designed to provide maximum results with minimum product application. Apply small amounts of Zymol wax for each application. Caution: Do not allow any Zymol wax to dry before wiping. Ingredients: Carnauba Wax (derived from Palmetto), Montan Oil, Coconut Oil, Banana Oil, Propolis (derived from Bees), Cetyl Esters, Cetyl Cocoamide (derived from coconut oil) and FD&C Blue #1..